The Arkansas Bill of Sale Forms are documents made available, to assist residents of Arkansas to provide proof, for sale or trade between buyers and sellers, that a legitimate transaction and agreement have taken place. 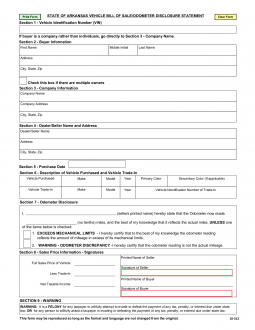 Some of the documents are required in order to achieve registration of the item purchased. Some will require notarization. Once negotiations are complete between the buyer and seller, select the type of document required and complete it. Boat Bill of Sale – To be used in the selling and acquisition of a watercraft sold and purchased between two parties. General Bill of Sale – Is used for an individual to provide proof of sale and purchase of personal property between two parties. Gun Bill of Sale – Should be used while conducting the sale and purchase of a firearm. Motor Vehicle Bill of Sale – This document will record the sale and purchase of a motor vehicle. As well, it will provide legitimacy to the reading of the odometer on a vehicle being purchased. Tax Credit for Replacement Vehicle Bill of Sale – This document would be used to receive a tax credit in the event you have sold a vehicle and purchased another vehicle for replacement within 45 days of the sale of the previous vehicle. Either a bill of sale or the current registration. Proof that you have liability insurance (if your vessel has an engine of 50 horsepower). Boater’s insurance coverage must meet the state’s $50,000 requirement and must be purchased with an insurance provider who is authorized to operate in the state of Arkansas. Proof that your boat has been assessed or is at least listed, for assessment in the current year. If your vehicle is less than 10 years old, you must complete and you must enter the odometer reading on the back of the title. You must provide proof of insurance within the state of Arkansas, by an insurance agency licensed in the state. 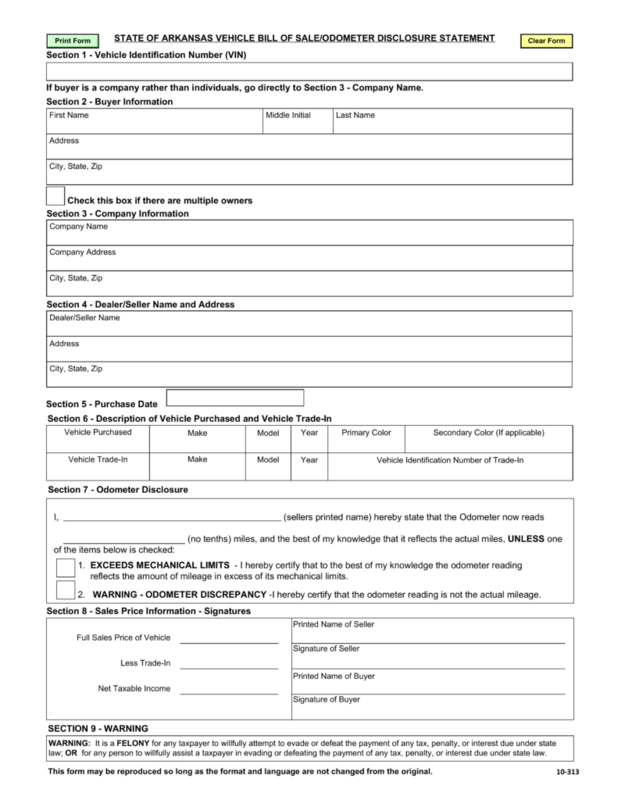 This is a legal document that will allow someone who has sold a vehicle and replaced that vehicle by purchasing another vehicle for replacement within a 45 day period. If you complete this document, you will receive a tax credit for your replacement vehicle. Even if you aren’t planning to apply for a sales tax credit, you should definitely use a bill of sale for your records as the seller. Completing the title would suffice, however, the title will go to the buyer. If you have a bill of sale, it will help keep important transaction details with you.